A Catholic, independent, college-prep school for girls, ages 1 – 12th grade. The entire track & field team had strong performances at the district meet held on April 17 at Lutcher. Browse through our helpful FAQs below to find answers to frequently asked questions about our website and/or mobile app. Q: How do I LOGIN to the new parent portal site? A: Simply click the LOGIN button on our website (ashrosary.org). You will land on our LOGIN Parent Portal to view Grade Level Info, view events and other school related info, click here to view First Time Login Instructions. Q: Where to I find specific Division Information for my child? A: Simply click the LOGIN button on ashrosary.org and use the same credentials during the re-enrollment/enrollment process. View "How to use the NEW parent portals?" Q: How to ensure your web browser is PCI Compliant with TLS v.1.1+? A: You may need to update your computer OS and browser to a TLS v.1.1+ supported version by March 15, 2018. Click here for to learn more about TLS and OS browser versions. Q: What is best browser to view ashrosary.org? * Support for Internet Explorer 9 and 10 ended on March 1, 2016. Microsoft ended support for Internet Explorer 9 and 10 on January 12, 2016, meaning they no longer fix issues specific to those version, including security issues. In addition, Internet Explorer 9 and 10 are not able to make use of many new navigational, mobile, media, and design technologies used in modern websites. Less than 2% of web traffic to ASHRosary.org is via IE 9 or 10, so this should not affect your users very much. ** These browsers are updated often, and incrementally. Our policy is to support the current version, as well as two previous releases. However, these browsers are also updated automatically, and it is recommended that the current version be used at all times. Q: How do I clear my cache and/or cookies? Click to view PDF instructions on how to clear your cache and cookies. Q: Can I add/sync a calendar with my Google/Outlook calendar? A: YES. Simply click the button on your calendar that looks like the image below and choose iCal to add/sync the calendar to your Google Calendar or Outlook Calendar. College Visits, Volleyball, Little Hearts events – you can select several different calendars based on your preference. Please note, Google Calendar is preferred, but it may work with other calendars. How to add the iCal Feed to an iPhone/iPad, click here. Q: How do I view calendar as a grid? A: Simply click the button on your calendar that looks like the image below. That's it. On All Ash Calendar, you can Customize Calendar based on your preference (look on the right banner on desktops). Q: Can I print the calendar? A: YES. First you need to view the calendar as a GRID. To do this, click the button on your calendar that looks like the image below. Q: What will happen to the ASH Rosary Mobile App? 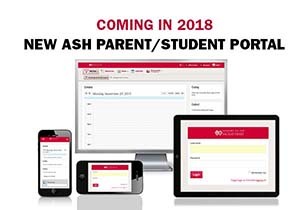 A: Now that we use ashrosary.myschoolapp.com for the latest directories and parent/school info, we will be phasing out the iPhone ASHRosary Mobile App during the 2019 school year. Our new site (www.ashrosary.org) is Mobile Optimized and Mobile Responsive, so you can use it similar to the way a mobile app works. 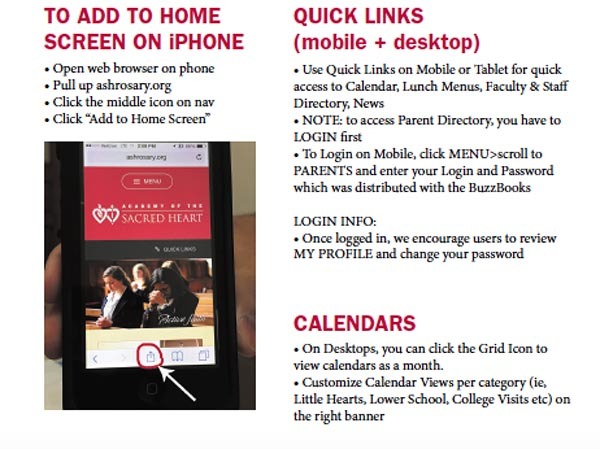 Another handy tip is to ADD www.ashrosary.org to your Home Screen on your cell phone, so you can access it quickly much like our previous App (Click here to view instructions, similar to iPhones). Q: How do I add ashrosary.org to my home screen on my cell phone? A: If you are using an iPhone, click here to view pdf instructions. Or follow directions below. Android phones work similar.